Early science activities, sensory bin suggestions, crafts, plus ideas for organizing a green-filled day and so much more! Word flashcards, coloring pages, puppets, activity sheets, games and many other printable documents for grassy fun! 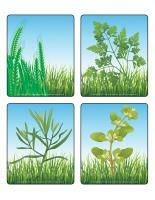 (Open thematic poster-Grass) Print, laminate, and decorate the walls of your daycare with all kinds of posters. 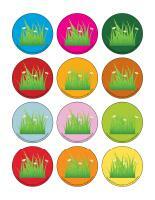 (Open educa-decorate-Grass) Print, cut out, and laminate. Decorate your walls and hang illustrations from the ceiling to create a special atmosphere for the theme. Cut out the illustrations and use adhesive paper to secure them on the floor of your daycare to decorate your area, to delimit your various corners and workshops or to create a path that leads to areas frequently visited throughout the day. Hang fresh herbs from the ceiling. You can find a wide variety of herbs at your local grocery store or gardening centre and they are relatively inexpensive. Display pictures of grass and herbs on the walls of your daycare and encourage children to observe them throughout the theme. This special tool was created in response to a special request received. (Open My allergy chart) Print, laminate, and display. Fill a container with grass and fresh herbs. Explore and discuss the contents of the container with the children in your group. Ask children questions and invite them to touch and smell the grass and herbs. You may even choose to let them play with the contents of your container. 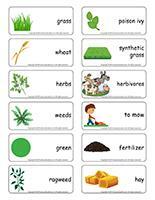 (Open word flashcards-Grass) Print and laminate the word flashcards. Invite each child to pick one word flashcard. Let them take turns sharing what they know about the item (ex. hay). Ask questions to encourage children to speak. 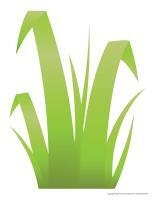 (Open picture game-Grass) The pictures may be used to spark a conversation with your group or as a memory game. Print, laminate, and store in a "Ziploc" bag or in your thematic bins. 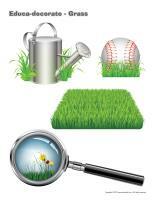 (Open picture game-Grass) Print the pictures twice and use them for a memory game. Empty flower pots (variety of sizes) that can be used to build towers. Gear and assembly games for creating flowers and plants. Use pictures of grass and hay to decorate your area and inspire children to be creative. Construction paper, tissue paper, empty egg cartons, recycled materials, and imagination for creating unique flowers. Pipe cleaners, drinking straws, and Popsicle sticks that can represent stems. Drawings that can be covered with glue and grass. Scent game. Add dried herbs to small plastic containers and invite children to smell the contents and try to identify the different herbs. Pictures of blades of grass (or actual blades of grass) that children can sort from shortest to longest. Modeling dough with leaves, plants, and flowers that can be pressed in the dough along with flower-shaped cookie cutters. Books about plants, flowers, gardens, etc. Gardening magazines. Ask parents if they have some they can share with you. 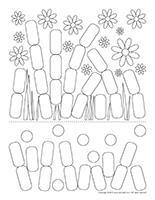 Connect the dots activity sheets involving flowers and plants. Sets of nature-related illustrations and children have to identify the differences. Set up an obstacle course that children must complete while holding a flower, a plant, or a blade of grass in their hands. 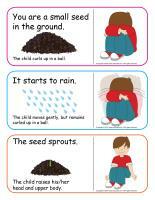 Act out the stages of a plant's life, from the seed to flowering. Musical flower game. Simply glue flowers on the floor and the possibilities are endless! Create your own flower-filled hopscotch by replacing the numbers by the corresponding number of flowers. (1=1 flower, 2=2 flowers, etc.). A container filled with soil, gardening tools, and plastic containers for digging, filling, and emptying. A container filled with soil that can be used to plant a small flower garden indoors and then taken outside during summer. Flowers and plants that can be transplanted with children's help. Experiment involving the flower that changes color when food coloring is added to the water. Build your own miniature greenhouse, plant herbs, and observe the changes over a period of several days or weeks. Edible flowers (available in some grocery stores). 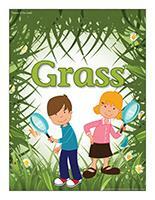 (Open sequential story-Grass) Print the story, laminate the illustrations, and cut them out. Ask children to place them in the correct order to recreate the story. (Open giant word flashcards-Grass) Print, laminate, and display the word flashcards on a wall, next to your circle time area or on a large piece of cardboard that can easily be moved around. Name a word and ask children to identify the corresponding word flashcard. 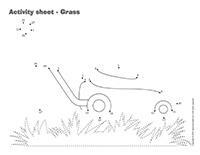 (Open transition games-Grass) Print, laminate, and deposit the illustrations on the floor to create a path leading to various locations within the daycare. The path can lead to areas children visit regularly throughout the day such as the bathroom and the cloakroom. The illustrations may also be used to delimit various workshops. (Open transition games-Grass) Print two copies of each illustration. Deposit one illustration on the table and cover it with Mac-Tac. Place the other copy in a bag. Children take turns picking an illustration to determine their spot at the table for the day. You can also use them to determine naptime spots or their place in the task train. 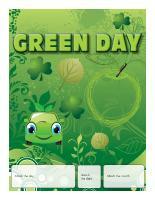 (Open perpetual calendar-Green Day) Print and display next to your daycare entrance to announce this special day. To greet children, offer to draw a four-leaf clover on their cheek. Serve a green cocktail. Simply add green food coloring to clear soft drink or apple juice. Add a green cherry, a lime wedge, or a celery stalk to each glass to decorate. Replace your regular light bulbs with green light bulbs. Hang green Christmas lights in your daycare to create a special atmosphere during lunch time or naptime. Encourage children to wear green clothing items. Wear a homemade green hat. Glue a variety of green items on an old baseball cap. You can also make green hats with your group or ask parents to make a green hat for their child at home. Hang green decorations and items on the walls or glue them on floors. For lunch, use green food coloring to transform food items. Serve shepherd's pie made with green mashed potatoes. Add green food coloring to the water in your pot if you choose to cook spaghetti noodles. Add green food coloring to each child's glass of milk. Serve broccoli, cabbage, green beans, peas, etc. For dessert, prepare a platter containing several green fruits: honeydew melon, kiwis, green apples, etc. Offer different dips (caramel, yogurt, pudding, etc.). At snack time, use a clover-shaped cookie cutter to prepare cookies and let children decorate their cookie with green icing and green cake decorations. Hang a large banner on a wall and ask children to make a green collage. They can cut green items out of catalogues and flyers, tear pieces of green paper, or use leaves, blades of grass, herbs, etc. Play a modified version of musical chairs. Replace the chairs you would normally use with green shapes that you stick on the floor or on chairs using adhesive paper. Play music and encourage children to dance around waving green scarves or pieces of fabric in the air. Use magnifying glasses to search for insects. Help children discover different types of flowers. Let them pick dandelions and form a bouquet. Arrange different types of fresh herbs in small bowls and set them on a tray. Invite children to smell and taste them. Go outside after a rainfall and smell the grass. Lie on the grass. Touch the grass with your toes. Form a standing circle with your group. Select two or three types of herbs. For example, two children can represent parsley, two other children can represent grass, and the remaining children can be chives. When you are ready, say, "Chives, get moving." The children who represent chives must quickly change places. Continue the game, making sure everyone gets the chance to change places several times. (Open lacing-Shamrock) Print, cut out, and laminate. Punch holes all the way around the shape. Let children thread a shoelace or ribbon through the holes. 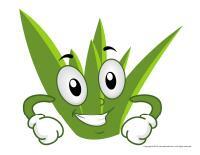 (Open models-Shamrocks) Print and laminate for durable, eco-friendly use. Trace, cut out, and stick the shapes on the floor. Children must hop from one shape to the next, moving forward, sideways, and backwards. 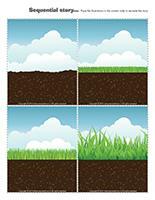 (Open educa-move-Grass) Print and laminate. Divide your group into two teams. Have each group sit at a table and deposit a single piece of paper (fairly large) on each one along with crayons. Play fast-paced music. Each team has the duration of the song to draw the best wheat field possible. Add green food coloring to your bubble solution. Children will love blowing green bubbles. Set large pieces of white paper on the ground or encourage children to "catch" the green bubbles with the paper. They will be impressed with the green impressions the bubbles will leave on the paper. (Open color by number-Grass) Print for each child. Children must color the drawing according to the color code. 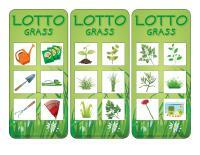 (Open lotto game-Grass) Print the playing cards and small cards. Let each child choose a playing card. Invite children to take turns picking a small card. Help them check their playing card to see if the item appears on it. When children find a matching illustration on their playing card, they must place the small card on top of it. If they don't see the corresponding item, they must return the small card to the centre of the table and it's the next child's turn. Invite children to stand in a row, on a line, leaving an arm's length between them and the children standing next to them. Tell them they are blades of grass. With their arms in the air, invite them to gently sway from side to side in the imaginary wind. Gradually, the wind becomes stronger and stronger. The children must therefore sway much faster. Next, the wind begins to swirl around. Children spin their arms, like a helicopter's propellers. At the end of the activity, the wind is once again calm. Children calm down by swaying very gently once again. Give each child a paper plate. Have them dip cotton balls in a small quantity of water and use them to completely cover the bottom of their plate. Sprinkle alfalfa seeds on the cotton balls and deposit the plates in a sunny location. The next day (or after 48 hours at the very most), sprouts will begin to appear. Children will appreciate tasting them. For this activity, you will need a large bin. Punch holes in the bottom of the bin and add one to two inches of rocks. Fill the bin with soil. With your group, plant a variety of fresh herbs (parsley, basil, chives, etc.). Teach children how they can care for the herbs on a day-to-day basis. Harvest the herbs once they are fully grown. 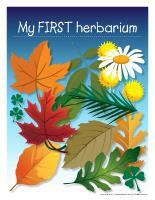 (Open my first herbarium) Print for each child. Throughout the theme (or summer), encourage children to collect a variety of leaves and flowers they can stick in their herbarium. Write the date under each new addition and use the Internet to identify their findings. With younger children, you may choose to use a single herbarium and turn it into a group project. Add water, a few blades of grass, and food coloring to each section of an ice cube tray and set it in the freezer. Set a colourful bin on a large towel and pour the ice cubes into your bin. Let children manipulate them, watch them melt, and touch the blades of grass. Fill a large container with soil and add gardening tools, plastic flowers, and an empty watering can (to avoid messes). Children will have fun pretending to plant herbs. You will need two plants that are very similar. Set one in a sunny location and water it regularly with your group. Set the other one in an area that doesn't receive any sunlight and avoid watering it. Observe the differences with your group and identify the two things that plants need most to grow (water and sunlight). Give each child a Ziploc bag and ask them to insert a few cotton balls. Provide bean seeds and have them deposit them on top of the cotton balls, inside their bag. Help them pour a small quantity of water over the seeds. Stick the bags on a window and explain how seeds need sunlight to grow. A few days later, children will begin to observe changes. Variation 1: You can do the same thing but use small yogurt containers filled with soil instead of Ziploc bags and cotton balls. Simply set the containers on a sunny windowsill. Variation 2: You may also use Styrofoam glasses. Children will enjoy drawing eyes, a nose, and a mouth on their glass. Use grass seeds. When the grass grows, it will represent the character's hair. Empty a few bags of colourful rocks in a large container and add blades of grass. Hide tiny objects or plastic gems in the container and encourage children to use their hands to dig them out. If you wish, you may also offer a variety of accessories such as shovels and small containers. Hide gold pieces (painted rocks) in a container filled with grass. Encourage children to find them. Fill a cardboard box that has a lid with grass. Cut a hole out of the top of the box and encourage children to take turns sliding their hand inside to touch the grass. Add green food coloring to a variety of white food items such as cake mix, milk, icing, cauliflower soup, and mashed potatoes. Empty the contents of one or two boxes of lime-flavoured Jell-O in a bowl. Note that the dry powder will be white. Sprinkle the powder on different food items such as apples, applesauce, vanilla pudding, etc. Like magic, the powder will turn green as soon as it touches the moist foods. (Open puppets-Grass) Print the models on heavy paper. Have children cut them out and decorate them using a variety of materials. Attach a Popsicle stick behind each puppet. 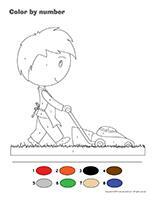 (Open models-Grass) Print the models and use them for different projects and activities throughout the theme. (Open I am exploring colors-Green) Print and laminate. Display in your arts & crafts area. With your group, explore the color green and the colors that can be combined to create it. 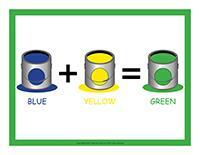 Offer blue and yellow poster paint and let children mix them together to create different shades of green. Hang a large white paper banner on a wall and provide containers filled with grass. Invite children to stick the blades of grass on the banner using white glue. (Open Plant shape) Print for each child. Deposit different types of seeds in the centre of the table and let children glue them on their plant. If you wish, you may ask them to color their plant before adding the seeds. Glue blades of grass on a large piece of cardboard. Encourage children to paint over the grass using green paint. Once the paint is dry, have them gently remove the blades of grass to discover unique prints. Cut a large piece of adhesive paper and invite children to fill it with pieces of green paper (construction paper, tissue paper, cellophane paper, etc.). Press a second piece of adhesive paper on top and display in a window. (Open models-Shamrocks) Print for each child. Pour a small quantity of green paint in the centre of each shamrock. Provide cotton swabs children can use to paint their shamrock. If you wish, you may add glitter to the paint for a special touch. (Open models-Circles) Use the models to trace circles on yellow and orange construction paper. If children use a large yellow circle, have them use a smaller orange circle or vice versa. Have them glue their smaller circle on their larger circle. When they are done, they can cut strips of yellow and orange construction paper to represent the sun's rays. Help them glue them all the way around their sun. Encourage them to draw a face on their sun. 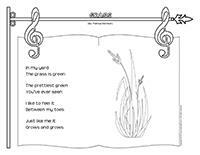 (Open coloring pages theme-Grass) Print for each child.